I wrote this the other day on my travels. 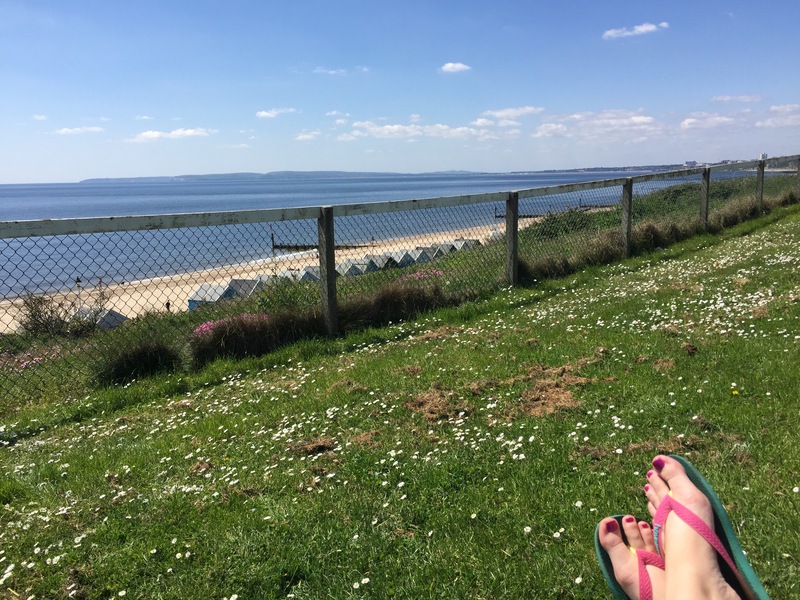 I stopped off on the Southbourne overcliff, the sky was clear, the sun was shining and all I could hear were the waves crashing on the sand – bliss. I love the beach – I find it a great place for thinking, there’s something about it that makes you feel happy, I think it has something to do with the feeling of being on holiday when you visit. It does of course depend on who you go with! If I go with Archie it’s generally loud, sandy, wet and slightly chaotic but fun all the same! But today I was alone..
For those who know me personally you know that I’m generally a happy, positive, friendly person. Over the last few months I have had to dig deep to find positive thoughts on all aspects of my life. After Betty died apart from Archie (and Scott) it just seemed like I had nothing in me to find positivity in. Yes I know I am extremely lucky to have a healthy son who is happy, a loving husband, a roof over our heads, food on the table – and an array of other things in our lives. But somehow it didn’t seem enough, I wanted and still want Betty. But we can’t have her. Trying to get a positive outlook on life back after something this bad has happened to you is really bloody hard. I am very lucky that myself and Scott constantly talk – anyone who knows me will also tell you that I don’t have a problem with talking! Ha ha! And that didn’t change even in light of our situation in fact some days I talk so much about what happened, I become so passionate about the subject that I worry others will think I’m going mad – that I’m getting carried away looking for an answer that isn’t there. Hopefully one day I can share with you what I mean by that. But getting back to my point about positivity, anyone reading this who is going through a hard time, whatever that maybe, we don’t have to have something as extreme as death happen to us to feel like life is hard. We all have our problems – some more trivial than others but to that person they feel like a big deal and we cannot measure one another’s problems by who has had the worst thing happen to them. Sometimes we can think of what has happened to others, like in our case, to put the importance of our own problem into perspective. But sometimes things like that don’t matter when you feel you are going through a tough time, you can’t see anyone’s pain but your own. But, if you can dig deep, take each day as it comes and try to remain positive (even tho at times that is the last thing you feel like doing) in a week, month, year from now you will look back and think WOW! That was tough but I am still standing, I got through it and I can face anything. You may have changed slightly as a person from it but that’s not always a bad thing. The things life throws at us are all lessons that enable us to learn things about ourselves or others that we perhaps couldn’t see before. I have learned who my real friends are, how amazingly strong both our families are and how much they love and care for us. How lucky I am to have a child and that me and Scott can survive anything as long as we have eachother. The rest doesn’t matter – you will never have enough money, you will always want something you don’t have and you are always looking for the next ‘big’ thing to happen, be it good or bad, this is a fact of life. But you are living it and how lucky are we to be here and have the things we have? Sometimes the best thing you can do is focus on what you have and not what you don’t, however hard, painful and unfair that may seem.